TypePad has once again been selected as a finalist in the 2008 Webware 100 Awards! In case you're not familiar with it, Webware 100 is CNET's yearly awards program where users nominate and then the public votes for their favorite Web 2.0 apps and sites. A few of you have asked for a quick preview of all 15 new themes we just added, so here you go! When we recently asked you what types of new themes you'd like to see, some of you requested themes that look sleek and professional so you can use them for your business blog. Our design team hopes the minimal look of the Baron theme will be a welcome addition to meet your needs. The Leaves and Starry Night designs are a bit more whimsical, but we like to think of them as "professional yet fun" which is what TypePad member Álvaro asked for in his comment to a recent post. The same theme can give off a really different feel depending on what color you choose; browse through all the color variations to see which one might be right for you! TypePad customer and owner of Atlanta-based web design firm Bella Web Design, Desiree Scales, is giving a webinar on Tuesday, February 26 entitled "The Power of Blogging". The online seminar is for small businesses that want to learn how blogging can help them communicate more effectively with their customers and other audiences. Our own Anil Dash, Chief Evangelist at Six Apart, will participate with Desiree in the presentation. There are still a few spots open, so if you know someone who's been considering blogging but wants to learn more about what it can do for them, please let them know about this seminar. As we mentioned a few weeks ago, our design team is working on bringing over some themes from Vox into Typepad. We asked for your help to determine which themes to add first, and hundreds of you voted in the poll we posted! The suggestions you left in the comments were also really helpful and the design team will use them for inspiration to create new themes. The poll results are in, and thanks to your feedback we'll make it a priority to bring over your top two choices - the Huntington and Cityscape themes - from Vox first. And though we only listed four cityscapes in the poll (Paris, NYC, SF, Tokyo), we actually have themes for twenty different cities that we can bring over from Vox. Since we saw requests for several other cities in the comments - from Boston to Sydney - we're going to work on bringing over every cityscape we have available. A huge thanks to everyone who voted in the poll. We'll be adding these Vox themes in the coming weeks, and will let you know here when they're available. We all know that capturing a prospective reader's attention within the first few seconds of landing on your blog can be a challenge, so what you need is a hook; something that will pull people in and make them start reading. If you've ever noticed a blog with a really special flair, chances are it's all pulled together by a great banner. Your banner is the first thing that people see, so it should be an eyecatching indication of what your readers can expect to find in your blog. If your account level is Plus or above, then you can make your blog stand out with a custom banner, too. You don't have to be a graphics guru to create a great banner. Simply start with an image that you would like to use as a base. Whether your blog focuses on crafts, business, family or photography, using a relevant image or illustration can really help set the tone. You can use a photo that belongs to you, or search the 'net for a free stock image. Once you have the image that you want to use, you'll need to edit it for size, and add some text - generally the title of your blog and a brief tagline works really well here. These steps can both be accomplished with an image editing program like PhotoShop, PaintShop Pro, or Paint. If you don't have access to these programs, don't despair! 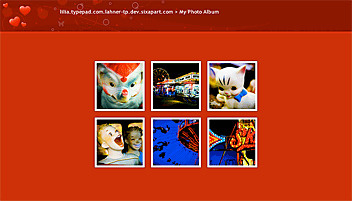 You can use an online image editor, such as Free Online Image Editor. Once your banner is the correct size (you can read about how to determine the right size for your banner in our Knowledge Base) and you've achieved just the right look, you'll want to add it to your blog. For our Plus, Pro and Premium users using a Custom Theme, the easiest way to do this is by going to Weblogs > Design > Change Theme, then clicking Edit This Element under Page Banner. Our Pro and Premium users who are comfortable using a little CSS can add a banner to a Pre-Defined Theme by adding a bit of code to Weblogs > Design > Edit Custom CSS (you can learn more and grab the code in our Knowledge Base). 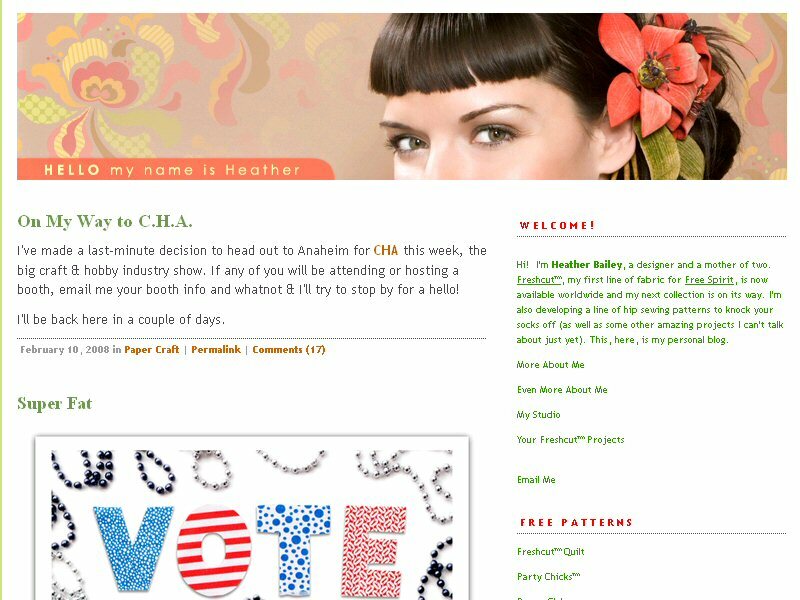 A great banner design can give your blog an easy, instant upgrade! 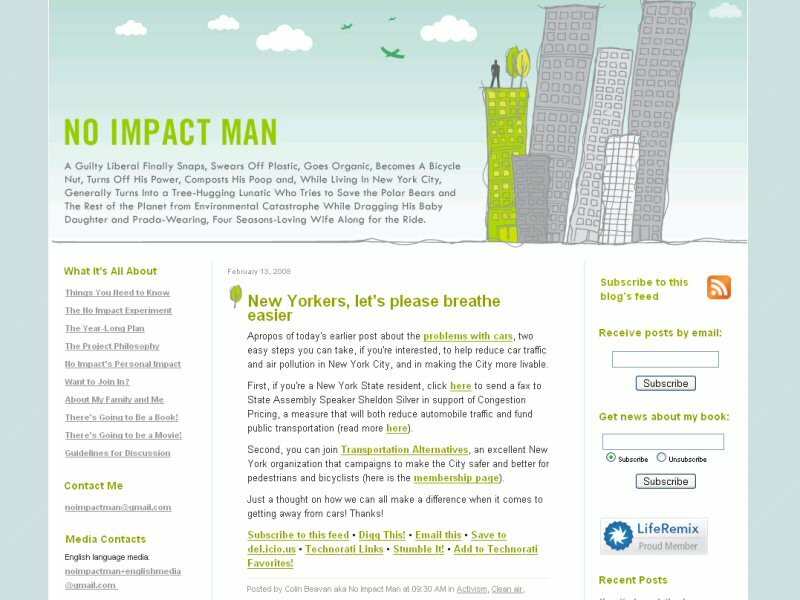 To get a better idea of how these TypePad bloggers are rocking their banners, click on each image to view a larger version or visit their blogs and show them some love: HELLO my name is Heather, No Impact Man and Posie Gets Cozy. You can find more tips for creating a weblog banner in our Knowledge Base. Our design team has been busy making plans to add more themes to TypePad. One project they'll be working on in the coming months is to bring over some of the professionally-designed themes from our sister service Vox for you to use on your TypePad blog. There are many styles to choose from, so the design team is asking for your help. Below you'll find a poll with some small screenshots of a handful of Vox themes. Vote for up to three of your favorites - you'll have until February 21st to cast your vote. Once the votes are in, they'll make it a priority to bring over the most popular themes first. The design team also wants to know what types of themes you'd like them to design for you from scratch. 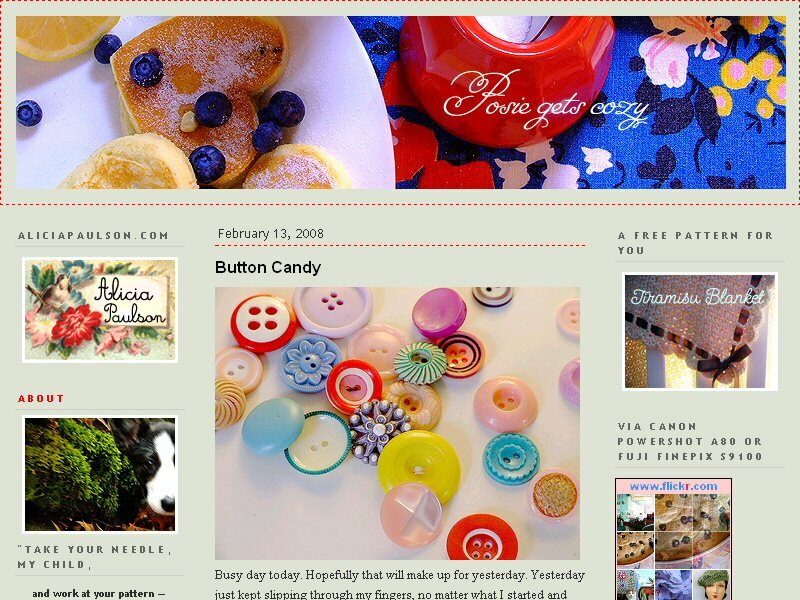 Would you like a theme that displays your interest - technology, sports, knitting, business, baking? Describe the type of themes you'd like to see in the comments, and the team will read through all your great ideas to inspire their new creations. Be sure to cast your vote and then share your ideas in the comments! TypePad customer, Blagica Stefanovski’s blog, Gal’s Guide was the only blog listed in the Women's Interest category of Chicago Magazine’s list of Best Chicago Websites. Providing interesting local and national tidbits for women, Blagica (pronounced “blah-gee-tsa”) covers everything a busy gal needs to know, including budgeting and finance, safety tips for women such as not wearing your work badges on public transportation, and tips on cleaning small appliances. Blagica also gives insights to current events that affect women, dating advice, and reviews on local Chicago restaurants, nightlife and merchants. As we've been reading through all of the feedback and ideas sent in from the TypePad community over the last few days, one request we saw many times was for new styles for your photo albums. We're excited to let you know that we just added four new photo album styles this afternoon. 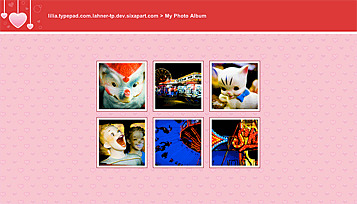 You'll notice a lot of hearts, red and pink in these themes, just in time for Valentine's Day. But we think there are lots of other occasions to use these lovely styles, from wedding and engagement photos, to pictures of your new baby, or to celebrate any and all of your passions and true loves, year round. 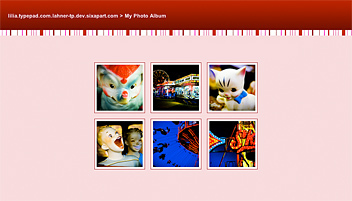 Find the new styles under Photo Albums > Design > Style and look for "Valentine's Day" in the dropdown menu. For further reading on photo albums, you can read articles in the Knowledge Base about customizing your photo album's style, layout and content. 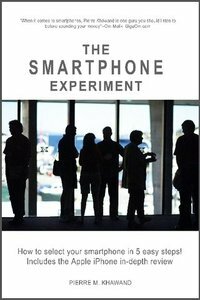 This virtual-book-tour guest post comes Pierre Khawand, who used his TypePad blog The 81-day-experiment as the launch point for his recently released book The Smartphone Experiment. In his post, Pierre talks about his motivation for writing the book and how his TypePad blog helped him gather feedback and build a community around the book as he wrote it. We have two copies of The Smartphone Experiment to give away to Everything TypePad readers. Just leave a comment with your email address (it won’t be published) so we know how to get in touch. Update: The giveaway copies have been claimed. The Smartphone Experiment is available for purchase at Lulu.com. 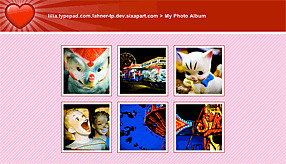 I have recently published The Smartphone Experiment book—how to select your smartphone in 5 easy steps, based on the 81-day-experiment blog (81dayexperiment.typepad.com) which I started on TypePad in August of 2006. In this blog, the focus was on using a variety of smartphones and reporting my daily observations about their features, plans, and usability, in order to help smartphone users make better decisions when it comes to purchasing a smartphone. In this virtual book tour, and in the next few posts, my attempt is to answer many of the questions that I have been answering in my radio book tour, about smartphones and smartphone safety. Because my focus is on productivity in the workplace (that is what my company, People-OnTheGo, trains in) and smartphones are becoming an important part of productivity. In addition, as more smartphone models are introduced and as technologies and wireless service plans become more complex, buyers are finding it more difficult to select the smartphone that meets their unique requirements. And with an average purchase price of $200-500, and several hours invested in setting up the device and learning it, a bad decision can be an expensive one. I wanted to provide business professionals with a one-stop resource that provided them everything they needed to make the right decision. 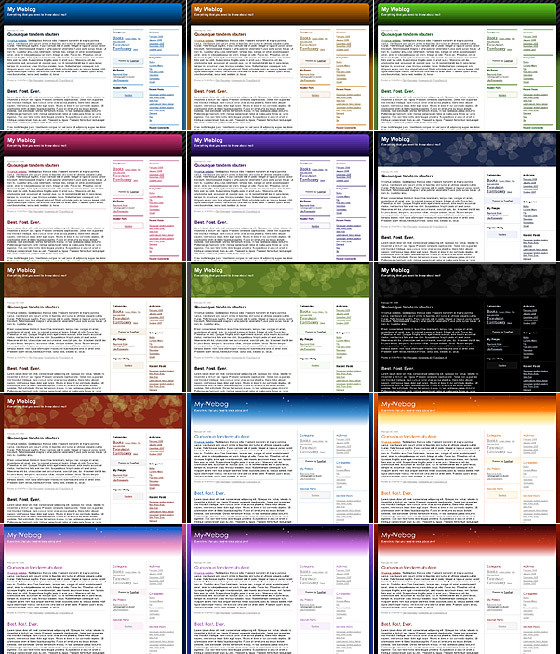 The 81-day-experiment blog, using TypePad, was the vehicle for creating The Smartphone Experiment book. It enabled me to easily have ongoing discussions with smartphone users and to form a community around this topic. I was able to start sharing my findings with the users starting from day 1, instead of waiting until I publish the findings at the end of the experiment. Most importantly, the ability to post the entries on a daily basis, and to get feedback frequently, gave me the motivation to keep going. It would have been a daunting project to write the book without the blog. The blog helped me break down this project into manageable and enjoyable smaller components.